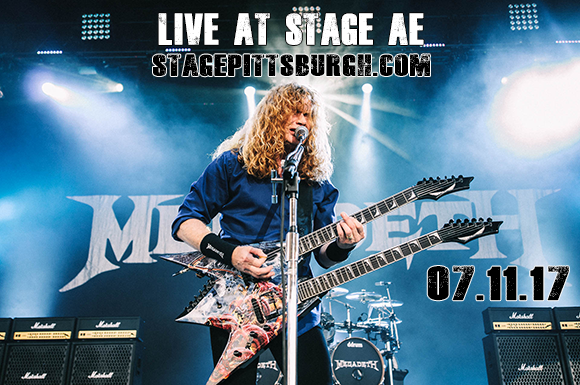 Thrash Metal fans get ready as the mighty; Megadeth, Meshuggah & Tesseract comes to Stage AE on Tuesday 11th July 2017! Megadeth are back on tour for this exciting summer ahead! These guys have been through the true 'Crazy World' of touring, from the 1990's up until today. With 36 years of writing music and taking to the road, they once again bring their exciting dates to you, their fans to endure! Whatever you do – don't miss out on this EPIC showcase! They will be performing both material from their classic albums and off of their latest release… tickets on sale NOW! The Californian Metalers, Megadeth hit the ball rolling in the mid 1980's as they signed over from independent label to mainstream Capitol Records, it was then that they were able to live up to their desired expectations and become the name we all know of today! Quickly the group left their past behind them and were included in the top four biggest metal bands of all time along with of course, Metallica, Slayer and Anthrax! However they are unique and widely known for their use of mind-blowing tempos, arrangements and rapid rhythms as well as their use of interesting subject matters through their lyrical content. A hugely influential act and a triumph in the music industry, Megadeth are still managing to pack out auditoriums, not just in the US but all around the world and have so many dedicated fans following their every move! These Platinum selling rockers will be taking to a stage near you this coming Summer – get ready it's going to be huge!